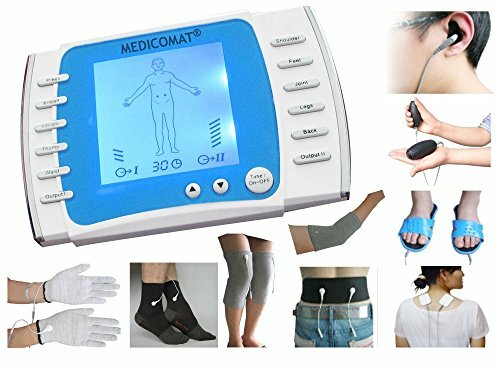 Medicomat® Medical Automat Series * THE WORLD'S BEST HEALTHCARE APPARATUS * Treatment Belt Knee Elbow Sleeve Wristlet Gloves Socks * Fully Automatic Treatment at Home - Auto-selection of acupuncture points on the ear, palm, foot and body. The latest highly effective portable device from the Medicomat series. Medicomat ear acupuncture provides an efficient and fully automatic treatment for the whole body, complemented by the effects of body acupuncture massage therapy through the palm and foot electrodes and conductive silver fiber garments socks, gloves, belt, elbow, knee and pads. The only thing the user needs to do is to choose the pulse that suits him the best and adjust their intensity to feel pleasant.